A miscellaneous mixture of records from South Australia was recently published on findmypast.com.au, including immigration, burial, military and agricultural records. These nine new data sets form a wide-ranging resource for genealogists and family historians tracing their South Australian ancestry. This article is the second in our series of three blog posts in which we explore these different record sets, what they reveal about South Australian history, and how they can help your genealogical research. Throughout the mid-1800s, the South Australian colony expanded outwards from the new capital of Adelaide. The wheat and wool industries were essential to the colony in its early decades, earning it the title of the ‘granary of Australia’ in later decades. As new land was explored and surveyed, farms were set up throughout the state and many squatters had their land converted to pastoral leases. Those who pursued agriculture faced several difficulties, from the declining soil fertility and drought that risked desiccating their land, to the higher production costs caused by South Australia’s lack of convict labour. Another challenge was the rough frontier lifestyle that many agriculturalists led. Early pastoralists and squatters often lived in isolated, far-flung stations, distant from even their closest neighbours. This isolation is borne out in findmypast.com.au’s South Australia remote deaths 1851-1965 collection. It contains records of burials in remote areas of South Australia, away from any known cemetery. The data was collected from a wide range of material, including newspaper reports, police files and government gazettes. Many of the 700 burials recorded in this collection were of men, reflecting the fact that more men were stationed in remote South Australia during this period. Tragically, some appear to have died of dehydration or starvation. Given their isolation, it was sometimes months or even years before their bodies were found. For instance, a record from findmypast.com.au’s South Australia remote deaths 1851-1965 collection recounts how, in 1886, the body of William Murray was uncovered in the state’s northeast, in the vicinity of Mount Lyndhurst Station. It is reported that William “died from thirst circa January 1880” – six entire years before his body was recovered. Others, discovered too late to be identified, were found as nameless skeletons scattered across the parched landscape, having succumbed to untold thirst. 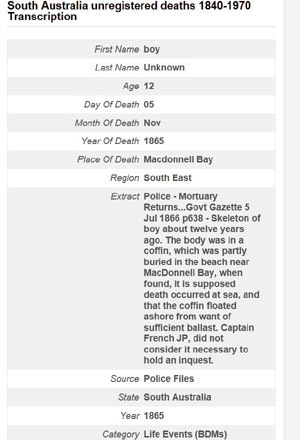 Such tragedies also linger among the records of findmypast.com.au’s South Australia unregistered deaths 1840-1970 collection. This contains deaths that were recorded in the media, police files or government gazettes but not officially registered in the South Australian Registry of BDM Indexes. Although the law clearly stated that a body could not be buried without a death certificate, practical considerations sometimes made this difficult. Though there is sometimes an overlap with the South Australia remote deaths collection, above, the South Australia unregistered deaths collection differs in that it encompasses all deaths that were reported yet not officially registered, granting it broader geographical scope. It covers not only the state’s remote outposts but also deaths that occurred in metropolitan, regional and coastal areas. In some cases, these records also report what happened after the discovery: whether the remains were buried, for instance, or whether an inquest was deemed necessary. The level of detail listed on these unregistered death records varies widely, particularly among those that were sourced from newspapers. For instance, one of the South Australian unregistered deaths 1840-1970 records on findmypast.com.au references a report from the Observer newspaper, on 19 February 1881, regarding a tragic opium overdose that occurred in Adelaide on 7 February. According to this record, a market gardener by the name of Ah Young had overdosed on the drug in what appears to have been a suicide attempt. He was brought to hospital by another man, named Tang Sing, but died later that day. As these examples suggest, many of these records paint a vivid picture of the struggle, misery and sometimes downright tragedy of everyday life, which is generally beyond the scope of official records. For that very reason, the new South Australian death and burial records – including lonely graves, unregistered deaths and remote deaths collection alike – provide an important genealogical resource. These records offer the opportunity for researchers with South Australian ancestry to trace the more elusive branches of the family tree, and unveil the stories of the sometimes overlooked ordinary people who helped make the state what it is today. If your ancestor died in a remote area of South Australia, or under mysterious or untraceable circumstances, search these collections for yourself today.